During the hottest and driest season of the year, the massive Chao Phraya dam in central Thailand, one of the largest dams in Southeast Asia, takes over an important role to manage irrigation for more than one million hectares of rice fields down south. 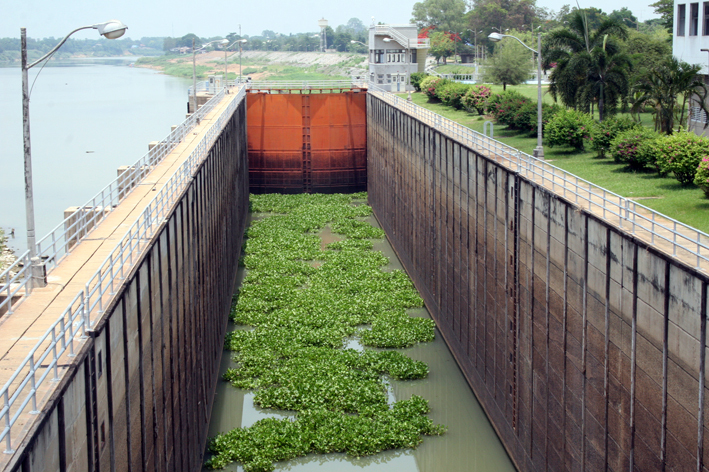 The dam, opened in 1957, might look a bit worn, but it plays an important and reliable role for water management in the central plains as well as flood prevention for Bangkok. It was the nation’s first large dam ever built (funded by a World Bank loan) and is located in Thailand’s Chai Nat province. With a total length of 237.5 meters and a height of 16.5 meters, the reinforced concrete barrage dam is built across the flowing river and consists of 16 spillways. There is also a 14-meter-wide water gate where ships can pass through, and a power plant that generates electricity from the flowing water and supplies it for the dam’s operation. 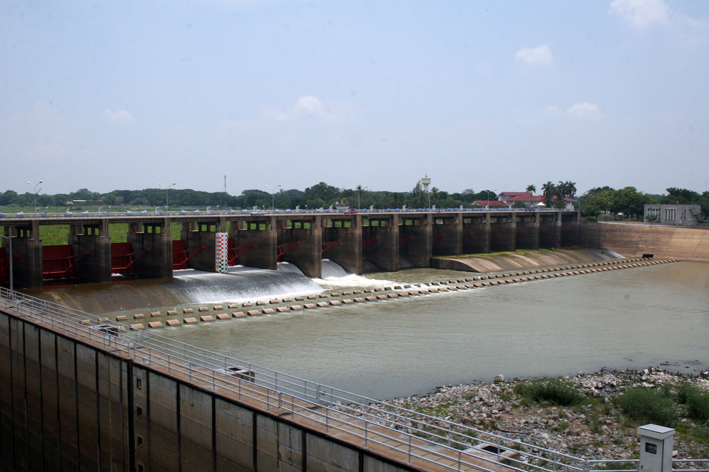 The dam holds the level of water backed up at 16.5 meters by regularly releasing it through channels that run down south through rice-growing areas, namely the Chai Nat-Pasuk channel, the Chai Nat-Ayuttaya channel, the Ma Kham Thaw channel, as well as the Noi river and the Supharn river, which all have sub-channels that supply irrigation networks and deliver water over thousands of kilometers across farm land. 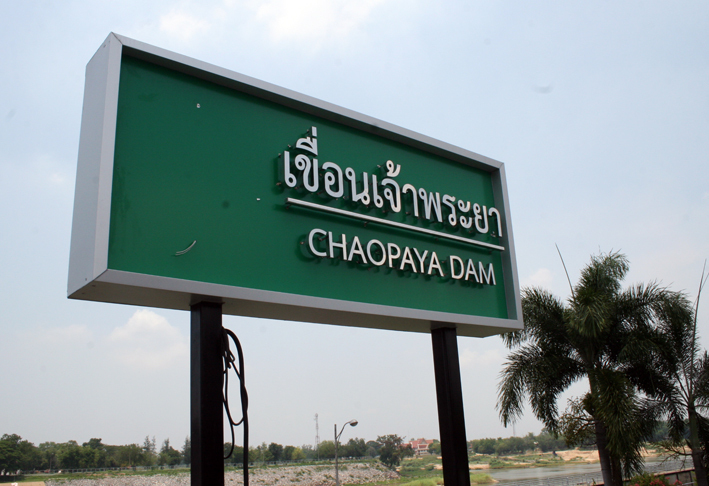 All in all, the dam is distributing water to an area of 1.16 million hectares in 17 provinces as part of the Greater Chao Phraya Irrigation Project, a sizeable part of the country’s total of 9.2 million hectares of rice-growing areas. This allows farmers south of the dam to grow and harvest rice two times a year, whereby the dry season rice harvest is the smaller of two annual crops, accounting for roughly a third of total annual production of rice with most of it planted in the irrigated areas of the central plains and the rest in the lower north which relies on water supplied from highland reservoirs. However, the dam also plays an important role in flood prevention. 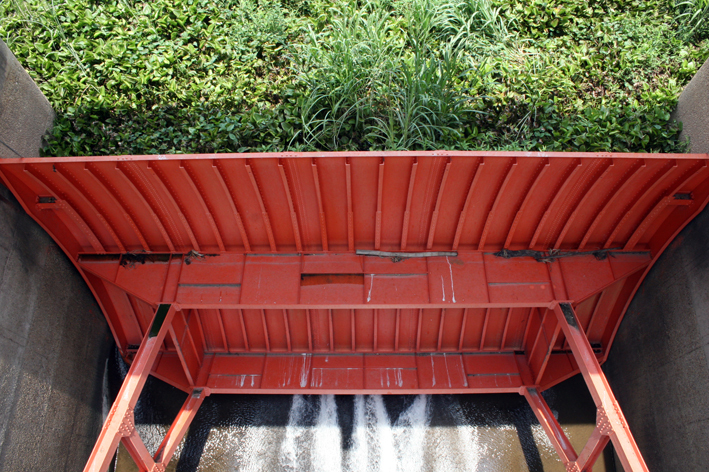 There is constant monitoring of water flows and the amount of water held back by the water gates. The flood management includes several tools for water monitoring such as measuring stations, a telemetry system, CCTV camera monitoring, as well as flood forecasting and monitoring. 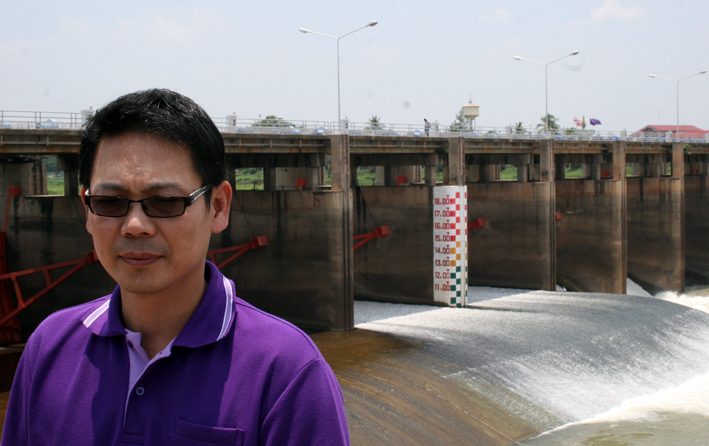 However, to take action in case of flooding risks the dam’s management relies on decisions by a government committee and the Royal Irrigation Department, said Thanarot Woraratprasert, Chief of Water Planning and Problem Solution at the Chao Phraya dam. This committee is set up to decide where and when water from the dam can be released as the government has to compensate farmers and other residents for the damage the released water brings about. 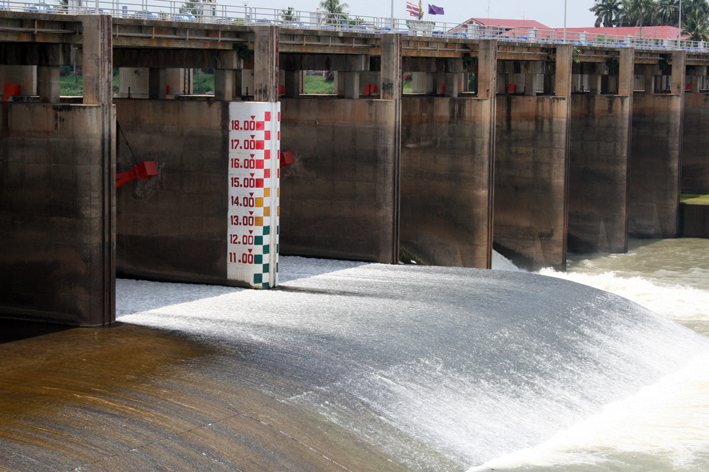 During the devastating 2011 floods in Thailand, the Chao Phraya dam initially had to increase water flow from the normal 890 to 1,300-1,500 cubic meters per second, which caused water levels downstream to rise by one meter. The flooding was intensified by heavy rains. At the peak of the floods, the water flow through the dam reached 3,700 cubic meters per second. According to Thanarot, the dam’s management anticipated the 2011 floods seven days ahead based on weather data and flood modelling. However, the reaction of the government and the responsible body, the Royal Irrigation Department, at that time was slow. What did the government learn from this? “That’s a long story. Among other things, they set up a compensation scheme for affected residents,” Thanarot said. All in all, water in the dam was at about 40 per cent above the annual average and filled to capacity, which prompted government officials to release more than 9 billion cubic meters. Floodgates in the connected channels were opened or simply broke as the government tried to relieve pressure on dams and levees along the way and send the water towards the sea. 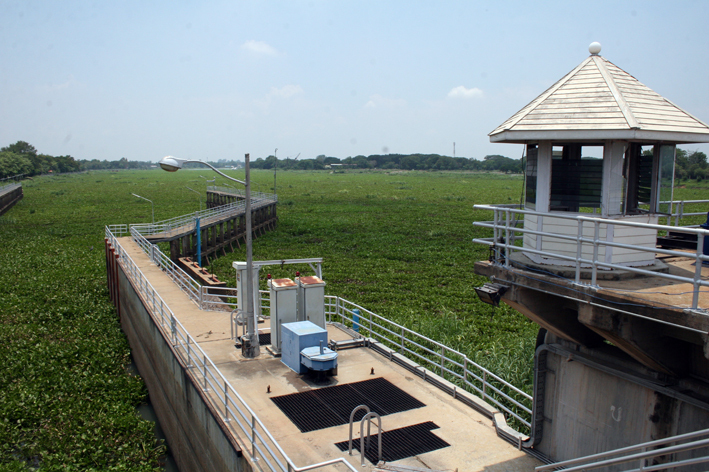 The water kept flowing through the irrigation channels and was inundating large areas of paddy fields in Singburi, Ang Thong and Ayutthaya, but lessening the strain on Bangkok as the fields served as water retention areas.